Type Rules! The designer’s guide to professional typography, 4th edition is a practical guide to the principles and practices of typography. From the fundamentals to cutting-edge applications, this edition has everything today’s serious designer needs to use type effectively. Type Rules! 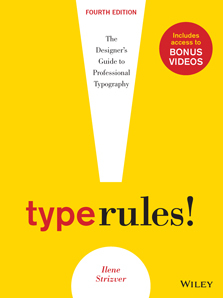 includes topics such as how to select the appropriate type for the job, how to set type like a pro, how to avoid common mistakes, and how to design a typeface, as well as how to fully harness the typographic power of InDesign® — with new coverage of their latest version. It also includes dozens of exercises to reinforce the understanding and application of the contents. New information on OpenType, Web fonts, and interactive typography. An expanded history of type, type designers, and an updated glossary of key terms. Exercises throughout to help reinforce the concepts presented in the book. A wealth of tried-and-true as well as recently developed type tips and tech tips including scaling logos, glyph positioning, and optical alignment. Coverage of many in-depth type issues, including formatting type, techniques for emphasis, kerning, tracking and word spacing. — Prof. Ed Benguiat, world-renowned type designer and educator, School of Visual Arts.